What Breadhammer might look like when he’s happy. Welcome to Splatter Elf Flash. A weekly (bi-weekly?) dose of flash fiction from my Splatter Elf world. If this little slice of fiction entices you, be advised that you can currently buy my first official short story in this universe “The Unicorn-Eater” at this very moment! I am currently giving away 10 free copies of this tale. If you’re interested, email me at philoverby1@gmail.com and I’ll hook you up. Hard bread, hard life. Breadhammer’s bread was so hard, he made a massive hammer out of a loaf of stale old rye. Stained with the blood of his enemies, sometimes he considered taking a bite out of it when he stalked the wastes of Groteskia. Yet then he remembered how inedible it was. 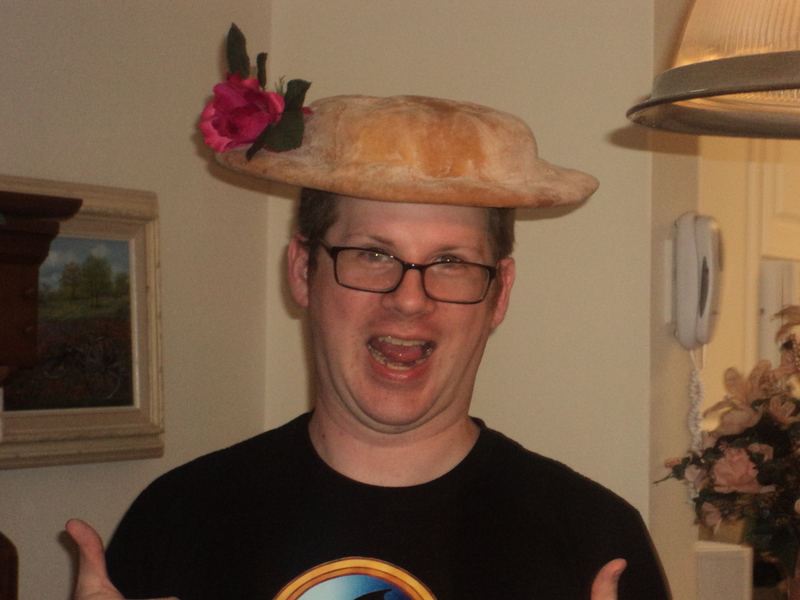 So inedible that he made a bread helmet out of another piece. His foes laughed when they first caught glimpse of him, but their laughs quickly turned to screams as he bashed them with his breadly weapon. They cried out for mercy as his bread maul slammed against their heads over and over. Skulls cracked. Rib cages collapsed. Necks snapped. They all died laughing. But these were mere mortals. He faced one of his most dangerous opponents before him. As if forged from his nightmares. A golem made entirely of hard bread. Someone had prepared for Breadhammer’s arrival in Brackenbrook. A foul wizard cackling behind the mound of twisted bread. The golem coughed up crumbs as it advanced toward the bread-wielding warrior. In his quest to eat of the soft breads of the Nine Bakers, he always came up against deadlier and deadlier enemies. This was his first golem. Not steel, not wood, not stone, not bone. But bread. “Who are you, fell sorcerer?” Breadhammer hefted his maul. “I try not to remember wizard names when I hear them,” Breadhammer said. Awesome stuff. When will we hear about the guy who uses intestines as a weapon and carries a ventriloquist dummy? And thank you for using the term “breadly weapon.” I was PRAYING you would slip that in somewhere as soon as I read the description. Looking forward to the next part!